Spectralux 901485 is one of those VHO or very high output T5 grow light bulbs. 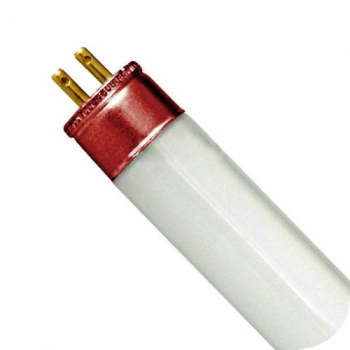 Very high output bulbs as oppose to regular high output bulbs have much bigger lumen output and a bit bigger watt intake and they produce a bit more heat but they are more effective in producing good growth. The Spectralux 901485 grow light is available in two versions – the ones with the color temperature of 3000K and ones with color temperature of 6500K. So in this post I will tell you what are their basic features and how the two are different. These VHO T5 light bulbs are manufactured by a company called Spectralux. They specializes in tree different markets – business, commercial and even military aviation, so these grow light bulbs are not their only product however they are one of their best! Spectralux since 1973 have worked in creating highly qualitative and useful products and are committed to their work and clients. Because both of these bulbs are Spectralux 901485 they are basically identical except for their color temperature and therefore usage. Both of them operate on 95 watts each but they give out a remarkable amount of lumens – 7,200 lm. That really is a lot for those watts they chew up – 2200 more lumens than a regular high output (HO) bulb with – so with these you really will get very very bright and powerful light to grow your plants under. The only drawback is that these lights have less total efficiency and the exact lumen to watt ratio is 75 which is significantly less than those regular High output bulbs I just mentioned but you need to remember that these VHO bulbs produce more light so growth under them will be more powerful. Another thing with these lights is that you have to be careful of how close you put it to your plants. It is recommended to put them about 12 to 18 inches from your plant canopy but I suggest you to just test out the heat and then see how close or far away you can put them. You also can have a little heat problem so you should think about buying some kind of ventilation system but for this much lumens and that small of wattage that really is nothing. You will be able to pay for other expense on behalf of saving money on electricity and having big and healthy plants. The great thing about these Spectralux 901485 bulbs is that they have a really good light penetration. So you don’t have to worry about the light not getting to the bottom leaves, because it will. And also the light is very uniform so it will be the same in every place it shines upon. And the average lifespan for these bulbs is 20,000 hours. These bulbs are 45.25 inches long (114.935 cm) , and 1 inch (2.54 cm) in width and height so pared with their white finish they look good and sleek above your plants. The difference in color temperatures only means that they should be used and are most effective of different stages of plants growth. If the 3000 Kelvin bulb in made for flowering stage of the growth because it emits more red light then the 6500 Kelvin bulb is made more for vegetative stage of growth, because the 6500 Kelvin are close to the color temperature of natural light which is more blue toned. Just remember to pair these bulbs (whichever you chose for your needs) with VHO light fixture because they won’t work with regular high output fixtures. And overall you and your plants can enjoy bright light and fast growth or good flowering and you can check out the 6500K bulbs and 3000K bulbs on Amazone for more reviews and their prices.